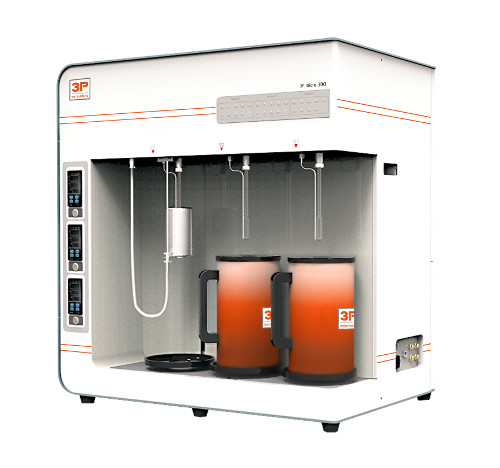 The 3P micro 300 is a fully automated volumetric sorption analyzer for measuring adsorption and desorption of Nitrogen and other non-corrosive gases on three independent analysis stations simultaneously. The instrument can be fitted with a turbomolecular pump and low-pressure sensors for micropore analysis and Krypton physisorption. Depending on customer requests, the instrument can be equipped with three mesopore stations (A version), one or two micropore and one or two mesopore stations respectively (B version) or three microporestations (C version). 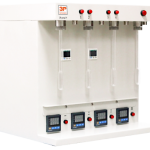 Every analysis station has its own dedicated dosing manifold for optimal analysis duration. It does not matter, if one, two or three analysis are started, the analysis time will remain exactly the same. Every station has its own p0-cell, which is equipped with a dedicated pressure sensor. All stations are completely independent from one another, meaning that measurements can be started at any given time on any analysis station. The three analysis stations can also be used for in-situ sample preparation to avoid sample contamination.